Analyze the cursive handwriting sample we’ve provided below. Post your analysis in the comments section and then tomorrow when we release the video, you can take a look back at your comment and see how well you were able to pick out traits from the handwriting sample, as well as seeing what other people thought and what they were able to find. Please leave your comments below the video so future members and readers can take away some bits of knowledge from viewing it. 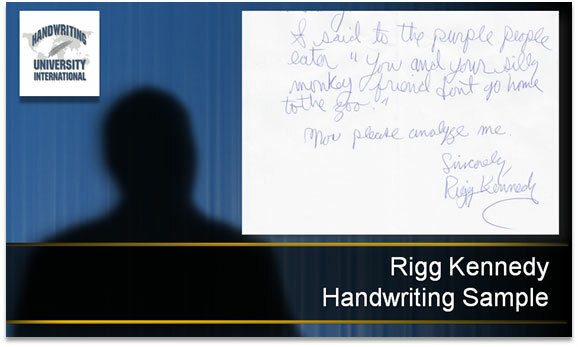 You will learn more if you approach these handwriting analysis videos in two steps. 1. Download and analyze the handwriting on your own, before you watch the video or learn anything about the person. This is the true test of how accurate you are using your handwriting analysis skills. Answer these questions in writing and POST THEM here, on this page. Is he opinionated or is he afraid to express his beliefs? Is he liberal or conservative politically? Does he keep his home neat and clean? What kind of choices does he make dating? Does he prefer to date men, or women? Does he follow rules effectively and efficiently? Does he work well on a team? Does he have more than one career or primary interest? 2. Wait until we release the 2 part video interview tomorrow, with the person who wrote the handwriting sample from today. Voila! The person’s character comes to life in breathing flesh and blood. So, the full video on today’s volunteer will be released to our members tomorrow. Check back here, in the weekly newsletter section, for the full 2 part video series. But, before you do, analyze his handwriting using your skills. I suggest printing his handwriting out and use a blue or red pen to draw arrows and trait names. Check back here, on this newsletter page, for the video when released. 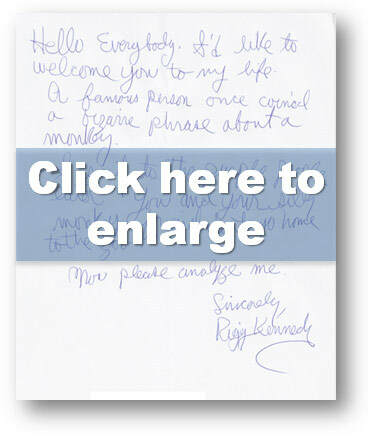 Download the Rigg K. Cursive Handwriting Sample here or click the image below (Adobe Reader is required). PDF file here. Click to Download high resolution image. Want to see new and never before seen handwriting interviews? Join the Handwriting University monthly membership.